Yesterday part of 290 was closed in both directions. Overall store traffic was slower. We did have 3 adoptions and referred people to BARC. This pup is named Eliza! The guys wanted to adopt a puppy and there were 2 on the van to go to another offsite. They were able to meet the pups and decided to adopt Eliza! 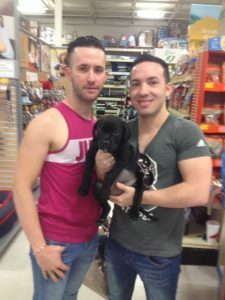 They were very happy with their new puppy and I am sure that will be a great home! This is Sassy! The mother and son prayed they would find the right calm dog to adopt. 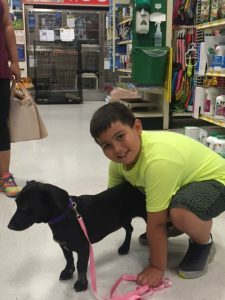 They were very happy to adopt Sassy and she was the perfect girl for them! They will bring her to BARC for heartworm treatment. This is Weda! Her new owner was looking for a sweet dog. 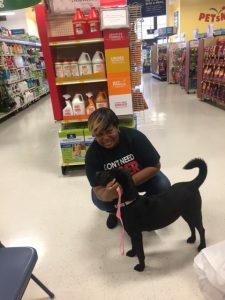 When she met Weda she was thrilled with this sweet girl! She will bring her to BARC for heartworm treatment. Thanks to all who helped make a difference in these 3 dog’s lives!